It’s a new year. Can you believe it? We both recall our older family members saying things like: time flies, don’t let time pass you by, and time sits still for no one. They weren’t kidding, were they? But there is something that they failed to mention: Although time keeps moving, we can continue to thrive as each passing year goes by. For us, we’ve found a way to keep our marriage (and spiritual lives) alive and well into each new year. We are going to share with you the four strategies that we’ve used for nearly 15 years of marriage that have given us hope, goals, passion, and a united front fighting for our marriage and family. Because of the reasons we are going to share below, we’ve managed to have a thriving marriage even through the difficult seasons of life. 1. Because we read the Bible together. We met each other during our undergraduate studies at a campus Bible study. After the 10-week study was over, we ended up forming our own college group (with our Pastor’s blessing) with a heavy emphasis on Scripture memorization. Reading the Bible together is something that we have kept a priority throughout the years. We know that without God’s word we have no chance succeeding in any area of our lives, and marriage is no exception. We firmly believe that this is a key component in a thriving Christian marriage. 2. Because we make a family vision and goals together. This has become our family’s unique New Year tradition. As each new year approaches we sit down with our Bible, pen and paper and begin to create a vision for our family for the new year. We talk about the amazing things God did throughout the previous year. We dream about what we’d like to see our family accomplish for God’s Kingdom. We ask God for wisdom as we create our family vision with a focus on monthly and yearly goals. This allows us to talk about many things and dream together, which in turn has helped strengthen and unify our marriage. 3. Because we pray together. We have managed to keep this a priority in our life even when we were separated by thousands of miles (due to 5 military combat tours). When we are together physically, we pray together every night for the day, week, month, and yearly goals we’ve created. When we are separated by distance, we pray via email and the occasional phone call. Prayerfully submitting our goals to God helps us stay on track and keep one another accountable. And of course there have been times where God has told us that our “plan” was not going to happen – and so we modified it, together. Prayer has kept the heartbeat of our marriage strong, and we are grateful for it! 4. Because we make focused time for one another. As parents of three children ranging from 6-13, we know how easily time and energy can be consumed with the daily tasks of raising a young family. However, we’ve made it one of our top priorities to make focused time for one another – even when we don’t feel like it. While we love one another unconditionally, we don’t always feel like putting one another’s needs above our own. But we both agree that we made a covenant before God and we refuse to be led by our feelings. This biblical mindset has given us the strength to make one another a priority over the last (nearly) 15 years of our marriage. 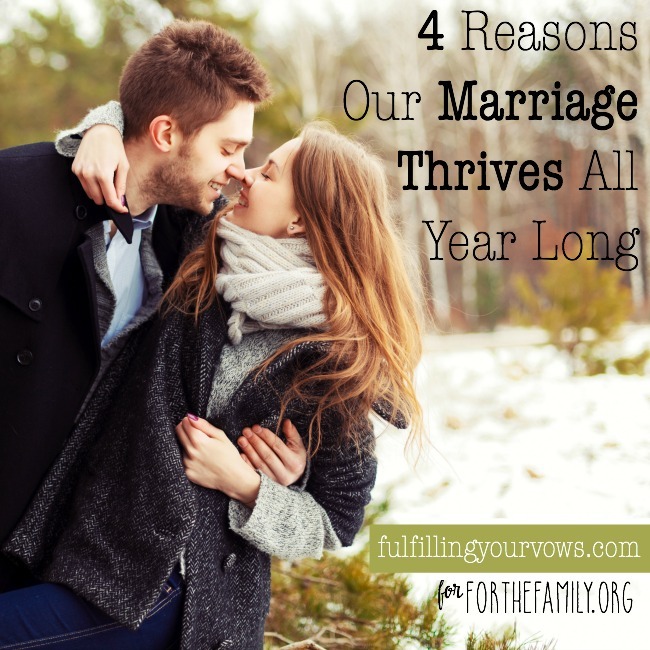 While these four strategies have worked wonders for our marriage, we’d encourage you to pray that God will give you a vision of our own to help your marriage thrive and thrive all year long! Even if your marriage is going well, it’s important to always work hard to honor God and your spouse by working together to strengthen your marriage. No marriage can ever be too strong, nor can any relationship with God be too strong. Keep striving, friends!